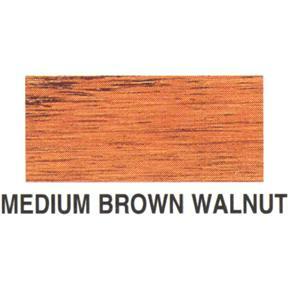 Solar-Lux Stain Medium Brown Walnut, 1 qt. 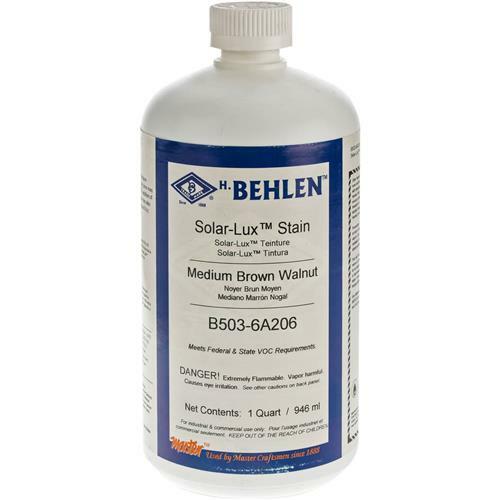 Behlen B503-6A206 - Solar-Lux Stain Medium Brown Walnut, 1 qt. Solar-Lux™ is a highly fade and UV resistant, dye base, non-grain raising stain. Its penetration & translucency enhance the wood’s grain pattern. Solar-Lux™ shades can be mixed to achieve custom colors, & it accepts a finish coat of polyurethane, oil or conventional lacquer. Apply with the grain & then wipe with a clean lint-free cloth. Solar-Lux™ dries to the touch in about five minutes but you should wait about an hour before recoating. Solar-Lux™ can be mixed into Behlen nitrocellulose spray lacquers to produce shading & highlighting toners. Use warm, soapy water or Solar-Lux™ Reducer to clean up equipment.